Some people seem to be under the impression that I never have kitchen fails. Believe me, just like everyone else, I have my fair share. Granted, they have become fewer and farther between with my increasing experience in the kitchen, but they still happen nonetheless. This cake was born of a major kitchen fail. Someone at work had a big birthday that slipped under the radar and some sneaky investigation revealed that a chocolate almond cake would have been his cake of choice. Fine, great, I was on it. Except my extensive internet searching really didn’t turn up the sort of recipes I was hoping for, and none from sources that I count as reliable. Eventually I found something that seemed like it could work, but the cake was way too small for our needs. I doubled the batter, baked it in a springform, and hoped for the best. Unfortunately the type of cake I had chosen is one where the usual toothpick test for doneness simply doesn’t work. The cake appeared totally done from the outside and came out of the springform beautifully but in attempting to transfer it to a platter, it fell quickly to pieces. It was underdone and inedible. And, it was 9:00 pm the night before I needed it. I may have said a few choice words and even shed a tear or two, but I was still determined to make a chocolate almond cake. 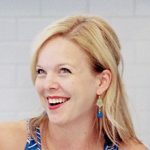 I did some quick thinking and searching based on the ingredients I had on hand, and within minutes I had a new game plan. One of the best things about Bundt cakes is that they are simple to whip up and look pretty when all is said and done. 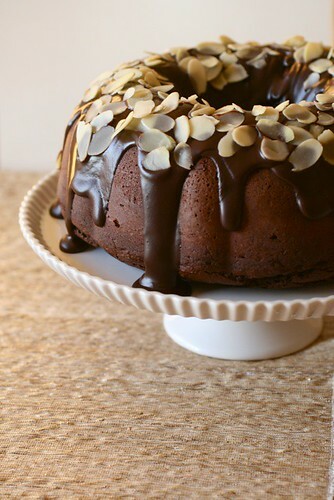 So, I jazzed up a basic chocolate Bundt with some almond extract, topped it with ganache and sliced almonds and finally I had a product I could live with. And you know what? I think this turned out much better than the original (much more complicated) cake would have. That little bit of almond extract in the cake gave it a great flavor and I had people asking all day what special ingredient I had added to make it taste so good. Thankfully something good came of the disaster cake endeavor. To make the cake, preheat the oven to 325˚ F. Grease and flour a 10-cup Bundt pan. In a medium bowl, combine the flour, cocoa powder, baking powder, baking soda, and salt; whisk to blend. In the bowl of an electric mixer, combine the butter and sugar. Beat together on medium-high speed until light and fluffy, 4-5 minutes, scraping down the bowl as needed. Mix in the eggs one at a time, blending well after each addition. Blend in the vanilla and almond extracts. With the mixer on low speed, add the dry ingredients in three additions alternating with the sour cream, beginning and ending with the dry ingredients and beating each addition just until incorporated. Mix in the melted chocolate just until combined. Pour the batter into the prepared pan, spreading the batter evenly. Bake until a toothpick inserted in the center of the cake comes out clean, about 50-60 minutes. Let cool in the pan 10 minutes. Invert onto a cooling rack and gently remove the cake from the pan. To make the ganache, place the chocolate in a small heatproof bowl. Bring the cream to a boil in a small saucepan. Pour the hot cream over the chocolate let stand 1-2 minutes. Whisk in small circular motions until the mixture is well blended and the ganache is smooth. Stir in the corn syrup. 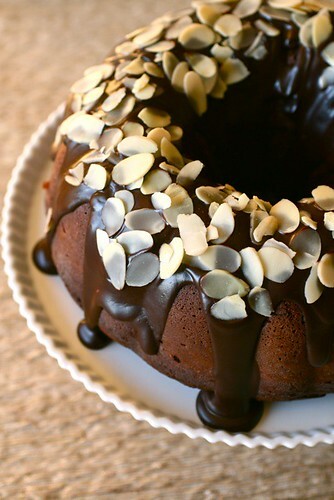 Drizzle the ganache over the cooled cake and garnish with sliced almonds before the glaze sets.